We have 2 new replacements for the stock rubber isolation bushings at the ends of the Transmission Crossmember in Turbo Regal's (GM G-Body cars). They are made from a MUCH stronger & tougher Polyurethane material. The replacement steel brackets are a LOT thicker & stronger, with all new CNC machined threaded mounting bosses. 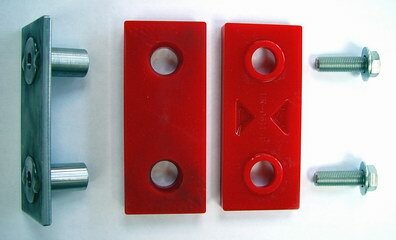 Grade 10.9 bolts are also included, and the brackets & bolts are zinc plated for rust prevention & appearance. 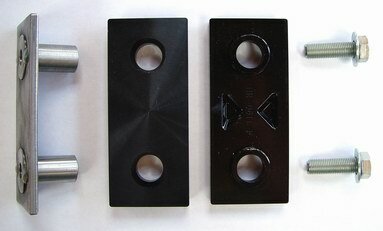 Each KIT comes with 2 steel brackets, 4 Poly isolators, and 4 bolts (enough for BOTH sides of the crossmember). The BLACK Poly is a Performance Upgrade of the stock rubber, with basically no additional vibrations transferred. These are great for daily drivers and cars down into the 10's at the strip. are designed for daily driving and for extreme racing conditions, without having to change the stock cross-member. They are soft enough to absorb vibrations for street use, yet rugged enough for racing. These mounts also have a unique, metal safety locking feature, effectively controlling torque. This feature delivers the extra strength to resist problematic torque forces. Unfortunately, GM used a rubber version of this mount without any kind of safety locking feature. The interlocking feature of the mount gives you that added confidence against drive train and chassis/frame damage. The RED Poly is our race version which is made from a stronger grade of Poly, and can handle ANY power level with minimal vibrations transferred. These are great for faster street/strip cars or all-out race cars. Why not order a Poly transmission mount while you are at it!